Fully revised for its third edition, the Oxford Handbook of Ophthalmology is a concise, systematic guide to all aspects of diagnosis, assessment, and ongoing management of ophthalmic diseases and conditions. Closely aligned with the curriculum for the ophthalmic postgraduate exams, and containing the most up-to-date clinical guidance, and practical advice, this is the essential resource for all those caring for ophthalmic patients. Covering the key information for both trainees and specialists; from clinical methods and the use of ophthalmic instruments, to basic perioperative care and advanced life support protocols. It includes new chapters covering laser procedures and theatre notes, as well as new sections on emerging technologies such as adaptive optics and gene therapy for retinal diseases. With expert advice, the latest clinical guidance, and its easy-reference format, this unique resource provides immediate access to the information you need, when you need it. 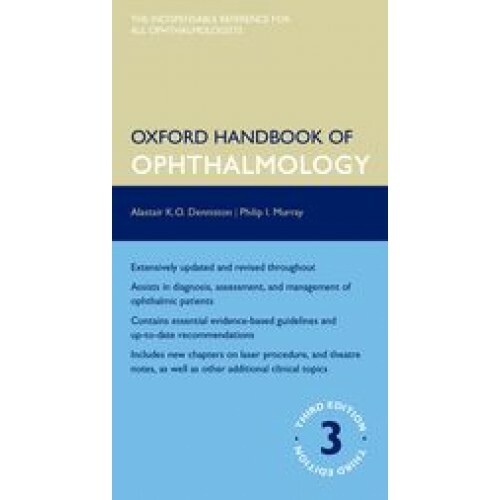 Readership: This book is aimed primarily at trainee ophthalmologists, but will also be of interest to qualified ophthalmologists, optometrists, orthoptists, ophthalmic nurses, ophthalmic technicians and non-specialist doctors with an interest in ophthalmology.